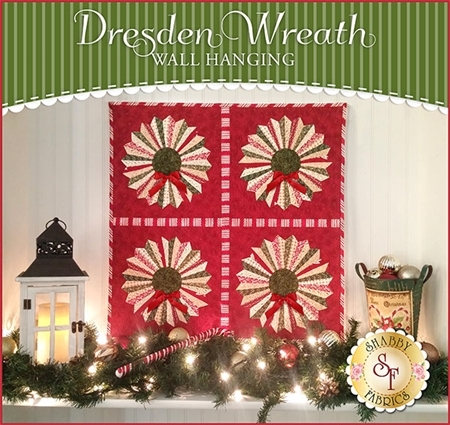 This block of the month has been incredibly popular! We've opened another round, starting October 2018, and can't wait for all of you to join us. 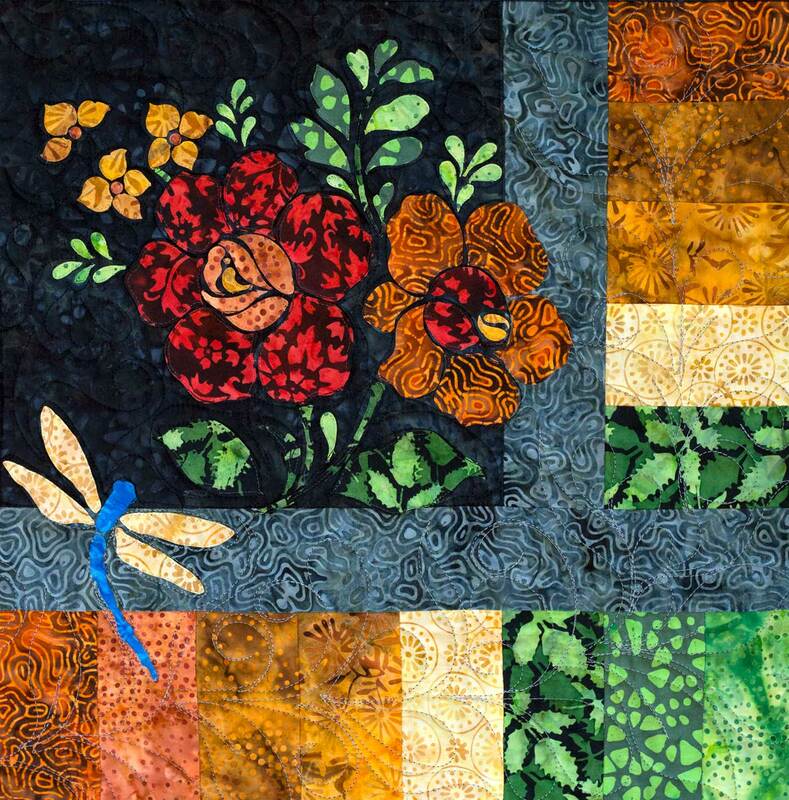 It's hard to look away from this stunning quilt, isn't it? 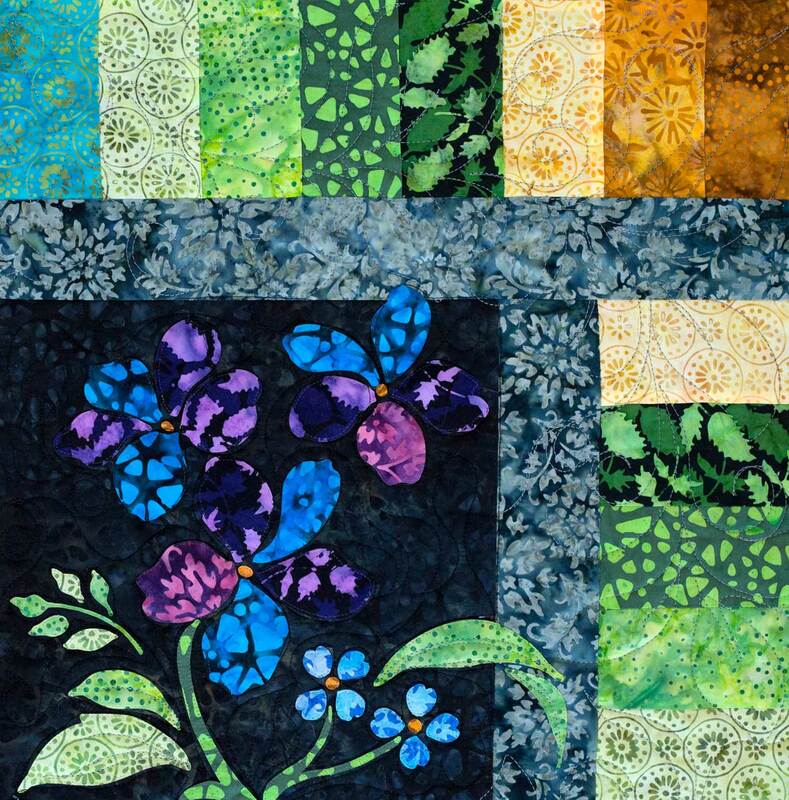 Enchanted Garden is a gorgeous block of the month program offered by Shabby Fabrics featuring delicate appliqué, colorful batiks, and simple piecing. This exciting 12-month program begins in July 2018 and runs through June 2019. 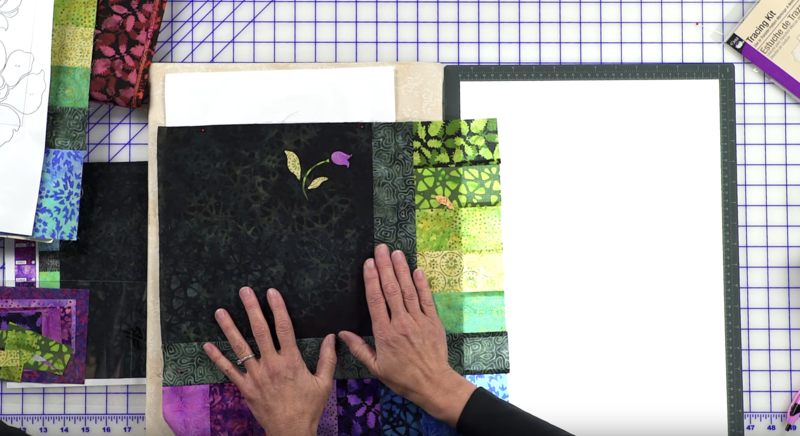 It includes all patterns, all pre-fused & laser-cut appliqué pieces, all top fabrics, backgrounds, sashing, and binding. Jen and Lynn made this wonderful video to introduce you to the program and share some tips and tricks with you. Watch the video here and then keep reading this post for even more detail! 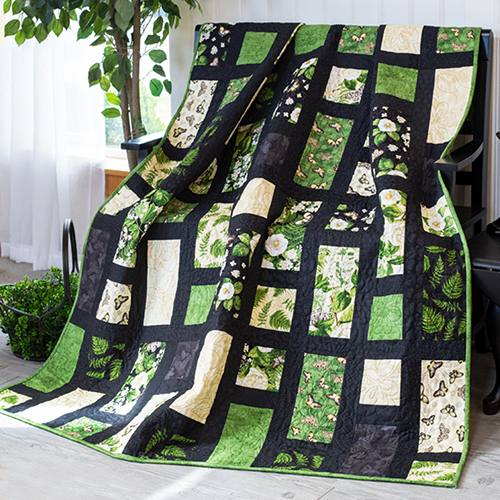 What made us fall in love with this quilt is all of the beautiful, intricate pieces, and Jen immediately knew she could make things easier for our customers if she laser cut this BOM. Can you imagine cutting that all out by hand? My hands hurt just thinking about it! 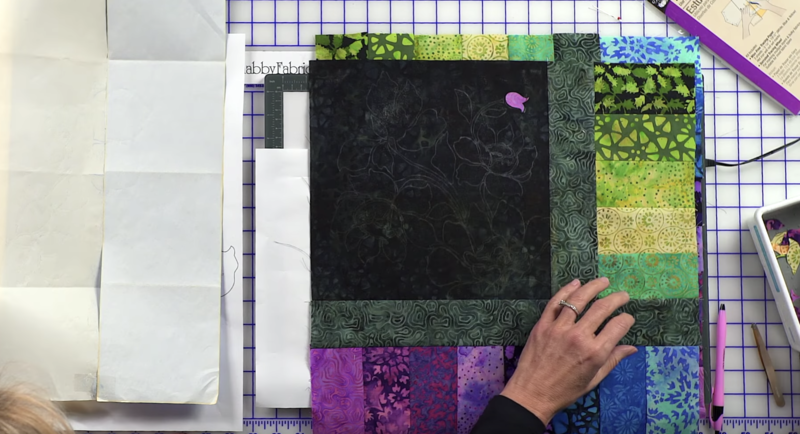 When you join our BOM, you get all of the pieces pre-fused and laser-cut, unlike when you purchase from other companies who provide you with all of the fabrics but leave you to do the cutting yourself. That means as soon as you get your package in the mail, you can get started on your block! No tracing butterfly wings or cutting tiny petals out - just place the pieces, iron them down, and stitch to secure! You'll love how easy it is when everything's prepared for you. Thread Director - Extremely helpful for keeping your MonoPoly Clear thread feeding straight for a more uniform seam and eliminate breaks! Full color picture with piecing instructions on the back. Oops Kit - Extremely helpful if an "oops" is made cutting or a laser piece is lost! 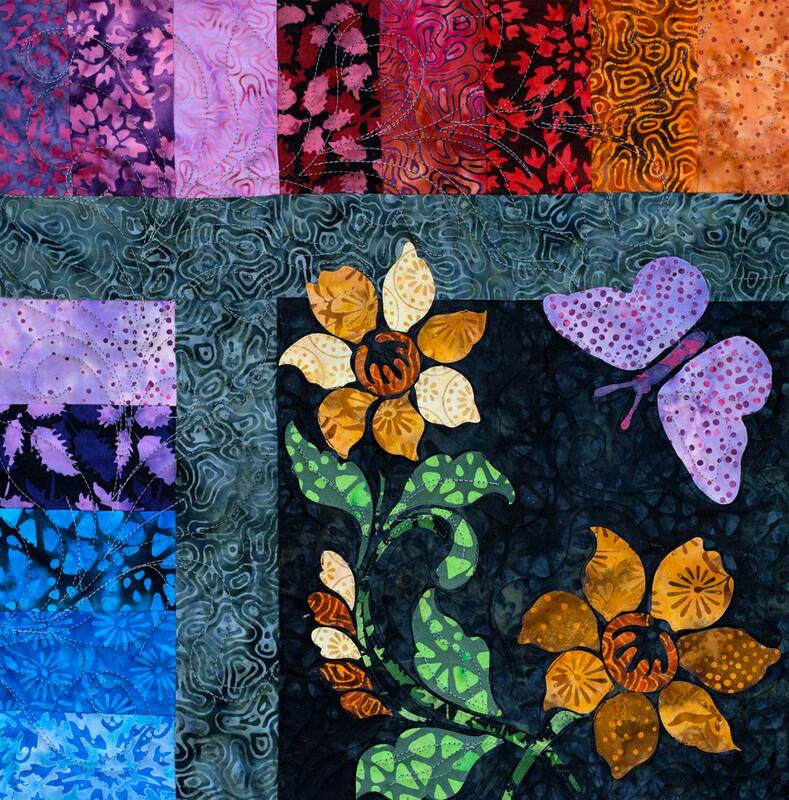 Includes one Fat 8th of 23 fabrics used in the quilt plus 1 piece of fusible webbing. 3 pc Thread Set - Extremely helpful to stitch down intricate laser-cut pieces, includes: MonopPoly Clear & Bottom Line for laser pieces as well a Sulky Cotton Thread for piecing. Sulky Stabilizer - Extremely helpful to reinforce fabric when stitching around laser shapes. Pack of twelve 12" x 12" sheets. 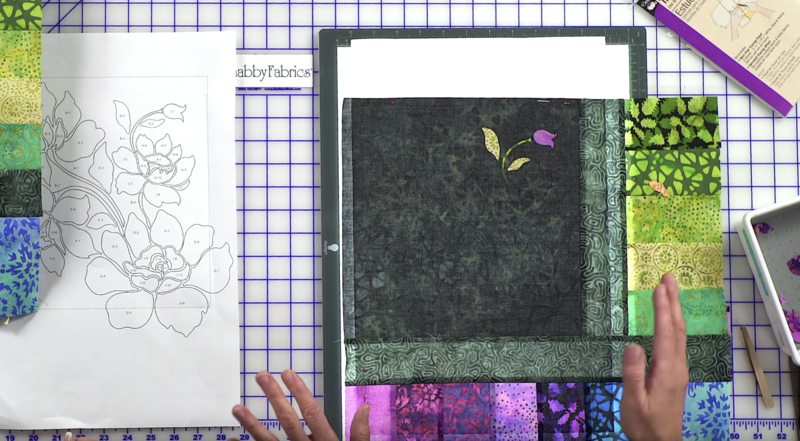 This BOM can be overwhelming with all of the little shapes, but we've got some tips and tricks to help you in the piecing, appliqué, and sewing process. As always, feel free to share your tips with other readers in the comments! These laser shapes are tiny and you don't want to lose any during the course of the project, so keep everything neatly together in a tray. As soon as you start working on your block, place your laser shapes in a tray. Separate the laser shapes (they are pre-cut and pre-fused for you) but keep the extra fabric until all your laser shapes are accounted for. 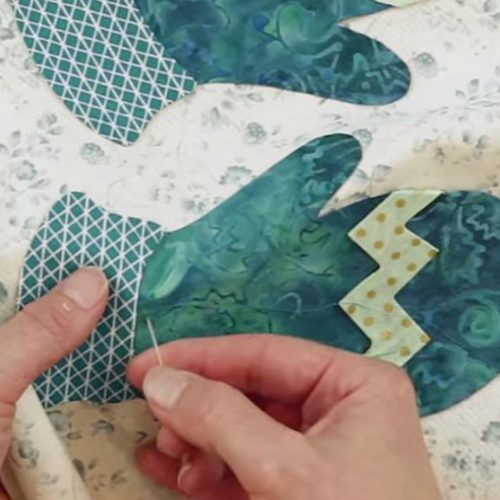 You don't want to throw away scraps and realize later that you missed a small shape. Use tweezers to help you with small placement. Some of these pieces are so small. They can be hard to grasp and place, so use tweezers to help you. It'll be so much easier for you to pick them up, place them, and move them around. This is great if you want to have some freedom in placement or artistic expression. 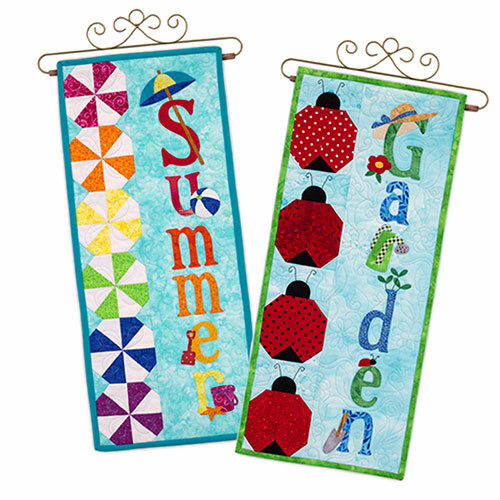 Simply work on an ironing board or ironing mat, place your diagram next to your block, and start laying pieces down. 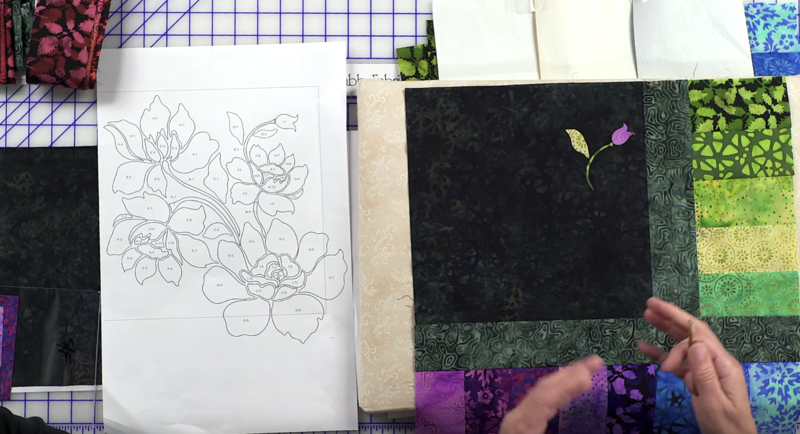 When all your pieces are placed, iron them down using the medium heat setting on your iron. Secure pieces down by stitching around the edge. The Tracing Kit comes with 3 sheets of tracing paper. You'll tape them together and place them on top of your block. Line your diagram up with the background on your block and use a blunt shape like a pen (but not the pen point) to trace around each shape. 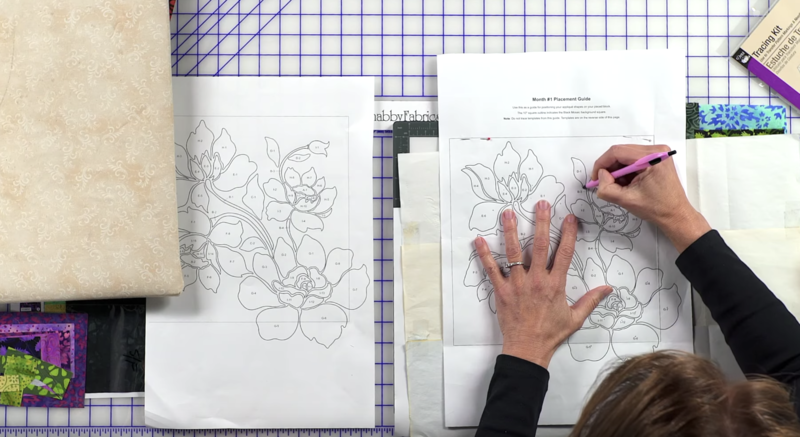 After you've traced all of the shapes, remove the diagram and tracing paper and start placing your pieces. Hint: If your chalk lines are still showing after you've placed and ironed your pieces, just take a damp cloth and wipe them off. They'll disappear! This is the fastest and most accurate method. Turn your Lightbox on and to the highest setting. Place your diagram on the Lightbox and place your block on top of the diagram. Once you've lined up the block on the diagram, pin them together so they don't shift during placement. Use the diagram as a reference for placing your pieces. 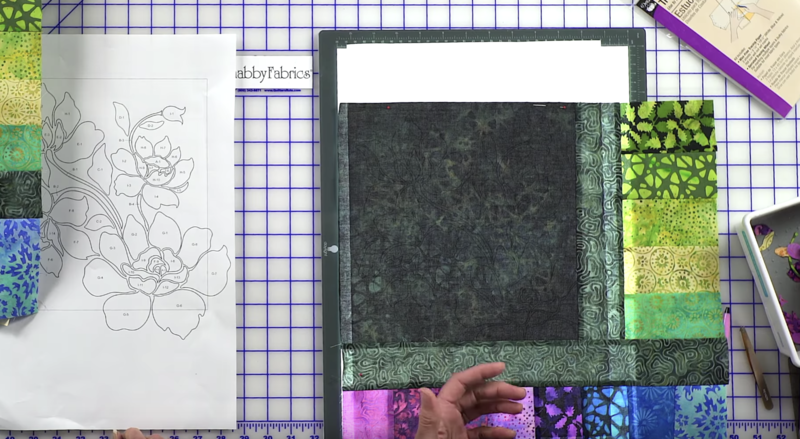 This batik fabric allows the light through so well that it's easy to see where every piece needs to go. After you've placed all the pieces, gently move the block to an ironing mat and iron the pieces into place. DO NOT iron on top of the Lightbox or you'll ruin it! Secure pieces down by stitching around the edge. If you haven't joined in on this BOM yet, you've got to! 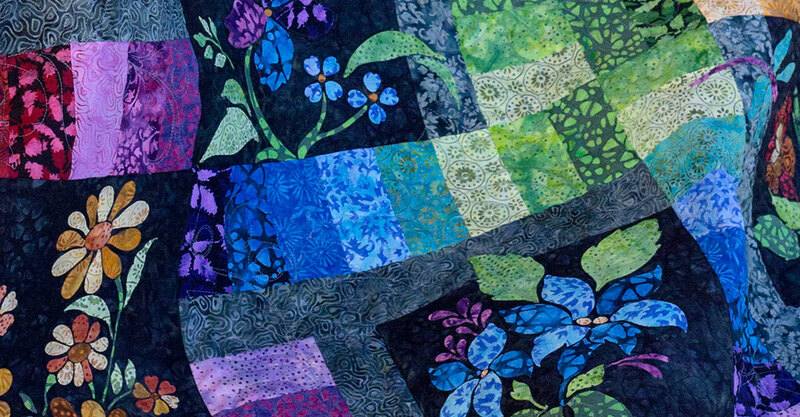 It is so much fun, and the quilt looks so incredible - you'll receive compliments on it forever. Really, everyone is so impressed by it, and for good reason. Have you already joined? That's great news! We'd love to see your progress! 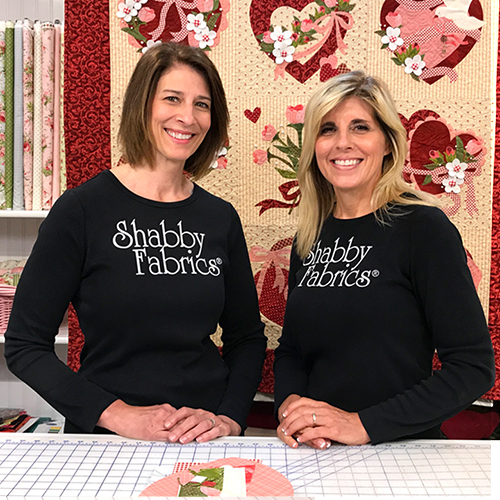 Send us pictures on Facebook or Instagram, or use #shabbyfabrics on Instagram for a chance to be featured!